Do you have an old picture frame lying around and you are not sure what to do with it? How about turning it into a decorative jewelry display? It will keep your pieces organized, accessible and free from tangles. It's kind of like a jewelry box, but better! Cut the chicken wire to fit the frame. Use the glass as a template. Hot glue the wire to the inside of the frame. Hang your jewelry on the wire for display. You can also use paperclips to hang necklaces. I made this with a an 11 x 14 inch frame I had bought at Arron Brothers for $25. The chicken wire cost me $10 because you can't purchase by the foot. Total project was $35. Oh my gosh I LOOVE this idea!!!! Did you make the one in the picture?? I am totally doing this for my dorm! SUCH a good idea!!!!!! I stumbled across your blog... SO happy I did! So cute! This is such a creative idea... most jewelry is far too pretty to hide in a box! I love this idea. Like most woman, I have sooo much jewelery that I'm always looking for creative ways to display it! Cute Idea. 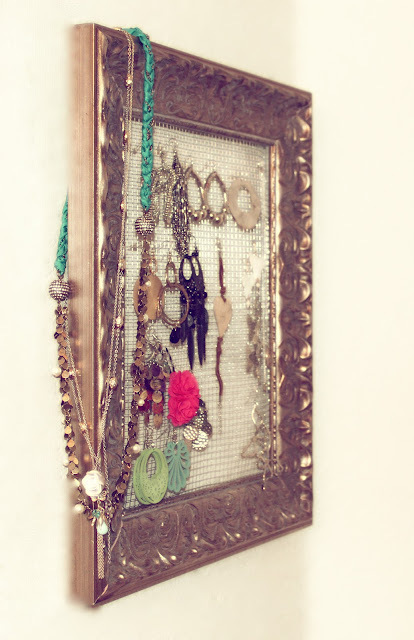 I need something like this instead of throwing all my jewelry into my cabinet and forgetting I have half of it! I am about to do something similar to this using a frame from dollar tree and pretty paper. Very cute idea!! I've made these as gifts before using cute fabric and lace, but I really like the look of the chicken wire much better! Do you know where I can buy chicken wire? I love this idea! It's so great! I'm still trying to figure out a way to do this, but be able to add stud earrings to it, since I have more of those than dangle earrings! Great idea. Companies keep on maintaining focus on new study fields and arrange learning programs for their employees to keep them up-to-date because they know that sole way to achieve leadership is remain in touch with latest education. I can suggest this custom assignment writing service for students and professionals.